Henry II (1133-1189) was king of England (1154-1189). He was born at Le Mans and died at Chinon (France). 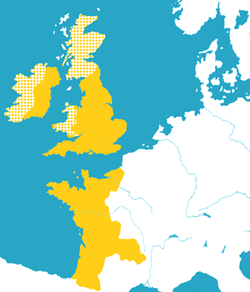 By 1172, he controlled England, large parts of Wales, the eastern half of Ireland and the western half of France. He was the eldest son of Matilda (daughter of king Henry I) and Geoffrey Plantagenet, a powerful French nobleman, Count of Anjou and Maine. He was the first Plantagenet kings. In 1154, he succeeded as king of England to his cousin Stephen. He restored order after the civil war during the Stephen's reign. Opposition of his policy on reducing the power of the Church was led by Thomas à Beckett, archbishop of Canterbury. Beckett was murdered in his catedralby four of Henry's knights. Henry was obliged to do public penance at Becket's tomb. He fought kings of France Louis VII and his son Philip August. Many times he fought his sons who rebelled. In 1152, Henry married Eleanor of Aquitaine. Eleanor possessed largest territories in south western France. Both they reigned over the Angevin empire. They had height children. His sons Richard the Lionheart and John Lackland succeeded to him.